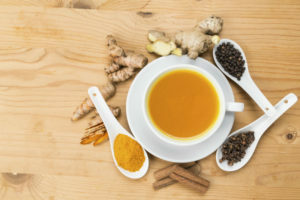 Whisk your chosen milk, cinnamon, turmeric, ginger, honey, coconut oil, peppercorns, and 1 cup water in a small saucepan; bring to a low boil. Reduce heat and simmer for about 10 minutes. Strain team through a fine-mesh sieve into mugs and top with a dash of cinnamon. This recipe can be made up to 5 days ahead, and stored in an airtight container and chill. Warm before serving.